Product prices and availability are accurate as of 2019-04-12 16:02:25 EDT and are subject to change. Any price and availability information displayed on http://www.amazon.com/ at the time of purchase will apply to the purchase of this product. Growing Information: Salvia Apiana will grow in a wide variety of soil types, but the soil must be well-draining. It is considered difficult to grow from seed, and germination tends to be slow and irregular. For best results, the seeds should be cold stratified in the fridge for 2-4 weeks. Then surface sow them in a moist well-draining mix and cover with clear wrap. Keep the seeds at a temperature of about 70 degrees Fahrenheit and wait for germination to occur. Once the seeds sprout, remove the plastic. Once the plants are established, transplant them outside to a location with full sun and well-draining soil. In areas colder than zone 7, plants should be grown in pots and brought indoors for the winter. The leaves can be harvested anytime from May through September and dried for later use. 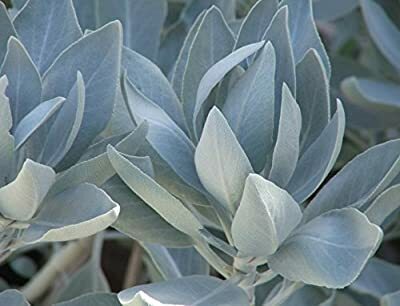 Salvia Apiana, known as White Sage, Desert Sage or Sacred Sage is a perennial evergreen native to the deserts of the southwestern U.S. and northwestern Mexico. It is typically found along the coast and likes dry slopes up to well over 5000 feet above sea level. It is quite cold hardy, reportedly withstanding temperatures down to 12 degrees Fahrenheit. On the other hand, it can reportedly tolerate heat up to 110 degrees Fahrenheit and is adapted to handle drought. e plant forms rosettes of silvery white leaves and typically measures about 2-3 feet in height. The flower spikes, rising from the center of the rosette and containing clusters of dull white flowers, can bring the plant's height to about six feet. It takes three years to reach flowering age. This species is perhaps the North American Indian's most significant sage. Growing Information: Salvia Apiana will grow in a wide variety of soil types, but the soil must be well-draining. It is considered difficult to grow from seed, and germination tends to be slow and irregular. For best results, the seeds should be cold stratified in the fridge for 2-4 weeks. Then surface sow them in a moist well-draining mix and cover with clear wrap. Keep the seeds at a temperature of about 70 degrees Fahrenheit and wait for germination to occur. Once the seeds sprout, remove the plastic. Once the plants are established, transplant them outside to a location with full sun and well-draining soil. In areas colder than zone 7, plants should be grown in pots and brought indoors for the winter. The leaves can be harvested anytime from May through September and dried for later use.